This tradition is an Intangible Cultural Heritage, and the masquerades, folk music and dance performances, children’s activities, gastro events and handicraft fairs that attract several thousand visitors. 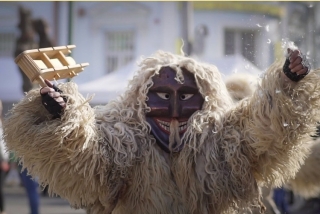 The Busos, wearing big sheepskin costumes and horned wooden masks make an impressive entrance: they arrive in rowboats from across the Danube and parade through the city, making noise with cowbells and rattles, to scare away winter. In the evening the celebrations concentrate around the huge bonfire in the main square of Mohács, where a coffin symbolizing winter is burned, while over 500 Busos dance around in a circle, making an even bigger racket, just to make sure that winter will definitely not come back. The Buso Carneval is one of the most famous Carnivals not only in Hungary but in Europe as well. We at HoliSnacks are proud to be part of it and starting our new tradition by feeding the Carnival Pets with our goodies.